with an introduction and notes by Stephen Mirarchi. 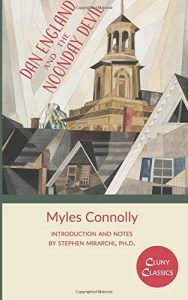 While O’Connor’s wrath settled on several of her contemporary writers (Cardinal Spellman’s sorry literary attempts in particular) and while she praised others (Midwest novelist John F. Powers, for example), O’Connor does not mention Myles Connolly as far as I know. She most likely would have known about Mr. Blue, Connolly’s popular, parable-like story, written in 1928 when he was twenty-seven. Published a year before the beginning of the Great Depression, Blue provided an antidote in a time when many were driven to despair. A young man, Mr. Blue is one in a long line of American non-conformists, but his method is to embrace a radical Catholicism that takes the gospel seriously. As a modern day St. Francis, he lives free of social expectations, worldly sophistication, and security. He spends money lavishly when he has it and relishes poverty when he doesn’t. He flies kites and sleeps on New York highrise rooftops. He prays on his knees devoutly. His charms attract even skeptics such as the narrator, who grudgingly comes to see something unique and precious in Blue’s eccentricity. Blue is the rare one among us who puts the lie to Chesterton’s famous adage, “The Christian ideal has not been tried and found wanting. It has been found difficult; and left untried.” Blue tries it, and he gives his life for it. If readers recognize Myles Connolly’s name at all these days it is most likely from Mr. Blue. However, Connolly returned to novels in the 1950s after a long hiatus. During that time, after dabbling in newspaper reporting and writing occasional short literary pieces, Connolly, aided by his friend Joseph P. Kennedy, left Boston for a screenwriting career in Hollywood at what soon became the famed RKO studio. There, as a friend of Frank Capra, he made a name for himself by helping write and produce over forty films, including contributing to It’s a Wonderful Life and Mr. Smith Goes to Washington. In the early 1950s, Connolly produced two novels: The Bump on Brannigan’s Head (1950) and Dan England and the Noonday Devil (1951). As they did several years ago with Mr. Blue, the Catholic publishing house Cluny Media has recently released new editions of these works, with an introduction and notes by Stephen Mirarchi and a brief preface by Connolly’s daughter, Mary Connolly Breiner. 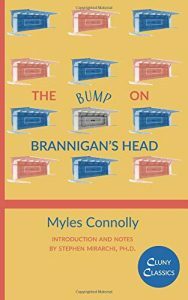 The Bump on Brannigan’s Head is told with Connolly’s characteristic straightforward prose and gentle humor. We first see Tom Brannigan arguing with his adult son, Little Tom, about going to Sunday Mass. Little Tom refuses to engage a religion that, he believes, produces hypocrites like his father who despises his neighbors so unabashedly that he’s grown a hedge so he can’t see their house. But when struck in the head in an accident, Brannigan undergoes a change of heart. His temper cools and his outlook turns more compassionate. His first positive action is to cut down the hedge: “‘Love your neighbor,’ says the Church. So,’ he waved wearily out of the window toward the neighbor’s house, ‘so, I decided to give it a try.’” He endeavors to put up with irksome people and forgive those who cheat him. He doesn’t always succeed: “‘This loving your neighbor is one thing; but this loving your enemies, that’s another kettle of fish entirely. Maybe I should have left the Gospels alone’,” he sighs. While Brannigan’s newfound charity begins to transform others, the local newspaper editor sees dollar signs in exploiting the newly minted “Saint of Whittiersville,” quickly mustering up a “We Love Everybody” Movement, complete with parade. When that ploy fails to sell newspapers, the paper just as quickly denounces Brannigan as a fraud (“You ought to have known better than to try to turn religion into news,” the editor growls at his cub reporter. “It’s gore—gore and obscenity; that’s what the readers want.”). Meanwhile Little Tom, a college educated “scientific type” who works at the Chemical Plant’s Atom Bomb Division (where “reality will surround you, will harden your mind till it is like steel, will crystallize your emotions till they are like diamonds, will stalk and destroy the Dream”) and who was never convinced about his father’s “sainthood,” has a change of heart and the two reconcile. As Mirarchi states in his introduction, the book emphasizes the difficulty of truly loving others, as the Gospels demand, yet the redemptive work of such suffering. Mary Reichardt is professor of English at the University of St. Thomas in St. Paul, Minnesota and editor of the Encyclopedia of Catholic Literature.